This is a sponsored post. I have been compensated to share the information with you. First things first…I am not a beauty blogger and you know this. I mean I couldn’t tell you a thing about contouring. I don’t really know the difference between bronzer and foundation. Yet, when something passes through my inbox that I hear a buzz about in more places than one I feel the need to share, share and share some more. Especially when there’s a giveaway for all of you!!! 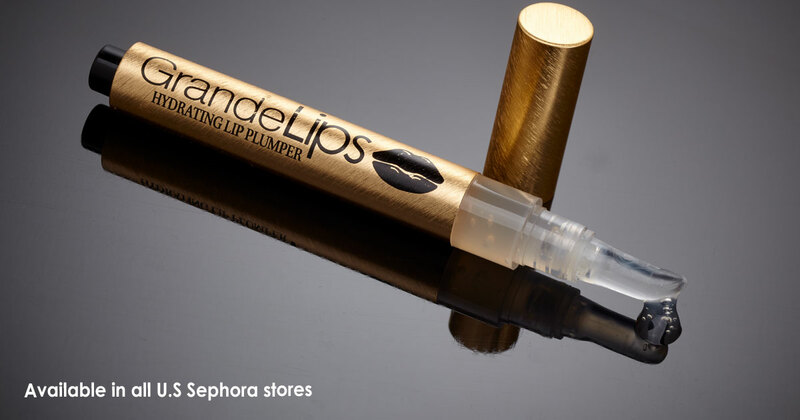 GrandeLIPS Clear Hydrating Lip Plumper is now available in all Sephora Stores! What is GrandeLIPS? It is an instant lip formula with long-term benefits and without icky parabens. Now while I might not completely know what those are, I know I’m not supposed to buy products that include them. And if I don’t have them on my skin and hair I definitely don’t want them on my lips! Infused with VolulipTM and hyaluronic acid, GrandeLIPS Hydrating Lip Plumper instantly improves lip volume in three to five minutes, adding a pop of lip-boosting color while hydrating dry areas. GrandeLIPS is a clinically proven formula increases overall lip hydration, volume, softness, and firmness in just 30 days of usage when applied twice daily. Its unique cushion applicator easily wipes clean, and it feels smooth on the lips and layers effortlessly with other lip products. Don’t be alarmed by the tingling sensation feel after application—that’s how you know GrandeLIPS is working its magic. This product is infused with vanilla flavor, is cruelty-free, and free of gluten. For best results, apply GrandeLIPS twice daily for 30 days. You can use GrandeLIPS in combination with other lip products. The GrandeLIPS color shades offer the same benefits as its original formula. In honor of this launch, GrandeLIPS is giving away $25 Sephora gift cards to 60 lucky winners of their favorite blogs! My blog has been chosen as one of those blogs, which means each of you has the chance to be on of the 60 WINNERS!!! Enter below. Winners will be selected at random. Once winners are selected they will be contacted directly and have their prizes mailed. Oh fun I love Sephora it’s one of my favorite me time self care places to go! Sephora has been taking all of my money lately! Don’t forget to get your free samples when you go! Super cool thanks We def love Vanilla flavor. What Is Peyton & Parker?